Jet Set Smart: "HANDS DOWN! THE BEST FISH SANDWICH IN BERMUDA!" 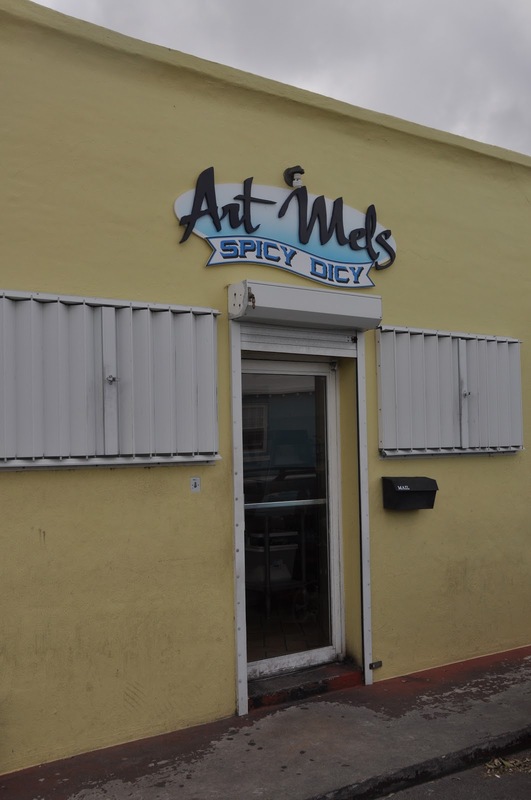 Each time I got into a cab during the week I was in Bermuda, I would always ask the driver about Art Mel's and constantly got different answers when I would ask how far away it was. Maybe because they didn't want to take me there, or maybe because it doesn't look like much on the outside or inside, or maybe because it's located in the "Back-of-Town" (the lesser traveled place by tourists). Whatever the reason I had to find this place before I left the island. And on my last day in Bermuda, I got into a cab with Nadanja Bailey, and thank goodness I did! He is not only a cab driver who was born and raised on the island, but he's also an Actor, Comedian and DJ, and he's well known in Bermuda. In fact, you can see one of his Stand Up Routines here on You Tube. We told him we wanted to go to Art Mel's, and he too was impressed we knew about it. Our one problem was that they didn't open until 12pm, and our cruise ship was leaving at 12:30pm. I WAS DETERMINED! And Nadanja made it happen. He called up Art Mel's and asked them to cook up two fish sandwiches and to have them ready at 12pm. Determination pays off! The sandwich is made with grouper which is deep fried, then it's served on pieces of light colored wheat bread. They'll ask you what you want on your sandwich, and the true Bermudian way is to order it with cole slaw, hot sauce and tar tar sauce on it...delish! Art Mel's is take-out only. The sandwich costs $11.50. It is one of the BIGGEST fish sandwiches you will find on the island and "HANDS DOWN THE BEST FISH SANDWICH IN BERMUDA!!!"